The bomb has landed and the news is out, we have blew the competition away with this one. The latest release to the Treadstone line up is our massive front mount intercooler kit available for the WRX STi. We have raised the bar in front mount intercoolers for your WRX with a massive 4.5" deep core, 28" long and 10.5" high making this the new benchmark intercooler! Capable of flowing 938cfm at 1.5psi pressure loss, this unit is efficient up to 900hp without breaking a sweat! With many of our private label intercoolers already on the market today, this unit is tried and tested on the track and the strip by many of the top names in Subaru tuning. Forget about heat soak with this monster, you can run on the track all day with out ever worrying of loosing horse power due to heat soak. We have field tested this with efficiencies of up to 95%! 08+ Cobalt SS 2.0 LNF Turbo, STAGE 2 PACKAGE Stage 2 Package Includes A Custom Trifecta map Trifecta OBD 2 cable Cold air intake Catback exhaust system (Aluminized w Muffler) Catless downpipe. Cobalt SS Stage 4, Turbo Upgrade Kit This is an upgrade kit, and does not include any bolt on parts that may be needed to run a complete stage 4 kit. Our STi kit has been re-released and upgrade from its original version! Turbo bracket has been reinforced, our oil catch can relocated, and flex joints put in to prevent cracks! Precision turbochargers are now also available! This is a 100% complete kit, and includes all hardware needed for installation. 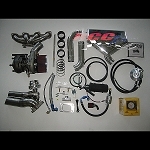 RCC 1999-2007 Suzuki Hayabusa Stage 1 Turbo Kit. 250 HP. Turbo that comes with this kit will support 400HP. RCC 2008-2014 Suzuki Hayabusa Stage 1 Turbo Kit. 250 HP. Turbo that comes with this kit will support 400HP. RCC 2008-2014 Suzuki Hayabusa Stage 1 Turbo Kit. 430 HP. Turbo that comes with this kit will support 400HP. RCC Kawasaki ZX14 Stage 1 Turbo Kit 2006-2014. Turbo that comes with this kit will support 430HP.